New Delhi: Confirming what demographers have already forecast, the latest numbers released by the Census of India on Friday show that the overwhelming demography of India is young. The population of the country below 35 years of age is 51.8%. Of this 48.2% are women and 51.8% are men, 30.1% reside in urban areas and 69.9% is based in rural India. Significantly, the Census numbers estimate the population in the critical demography category of 18-35 years of age to be 31.3%%. Not only does this demography dominate spending in the rapidly growing consumer economy, it is also likely to be critical in the context of the general election due by May 2014. The first-time voters, estimated from the Census data and adjusting for the fact that the survey was conducted in 2011, stacks up to 149.36 million—the Election Commission estimates the total number of voters to be 725 million. “These first time voters now have greater access to the Internet and newer media coupled with a higher literacy rate. There is a high chance that political parties and leaders that follow a conscious branding strategy may just make a difference," Jai Mrug, a Mumbai-based political analyst, said. “Young, first time voters generally tend to fuel anti-incumbency because they want a change—this is a trend that may be seen in the ensuing elections," he said. 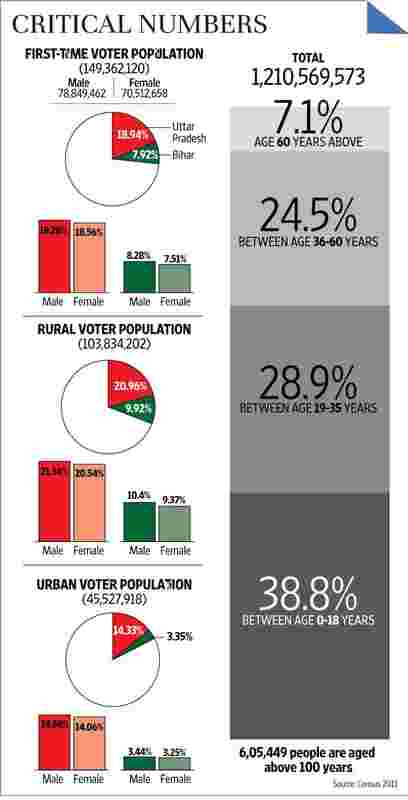 In a recent interview with Mint, Pratap Bhanu Mehta, president of the Centre for Policy Research think tank, argued that it is unlikely that young voters would vote as a block. “It has been more regional. I don’t think that is going to change hugely," Mehta said, adding, “I think the place where it does make a difference is that a lot of the old historical examples by which the parties used to discredit each other probably, for good or bad, no longer have any resonance. Memories of the Emergency, 1984 (anti-Sikh riots), all of that, which in a sense defined that ideological space, perhaps even around secularism and so forth, are not very big for these kids." Accordingly, Mehta argued that the present demographic context provided an opportunity for a new discourse. “So any party that keeps reverting to that old record is likely to be at a disadvantage." D.K. Joshi, chief economist at the rating agency Crisil Ltd, said if enough jobs are not created, unemployment could be a major problem in the next couple of years. “The government, over the next couple of years, should prepare the youth for jobs by imparting skill training as well as create enough jobs for them. For that, we need to revive the industrial sector. While we have grown fast in the past, now growth need to be employment-intensive to create enough jobs," he said. According to government data, employment in the five-year period ended 2009-10 grew by one million, while economic growth over the same period averaged 8.7% leading to a scenario of jobless growth. Every year, about 12 million people join the job market in the country. According to the provisional census data released earlier, of India’s 1.21 billion population, 833 million people live in rural India and 377 million reside in urban India; 31.2% of the total population lives in urban centres compared with 27.8% in 2001 and 25.5% in 1991. The new numbers, which detail the demography of the consumer economy, have drawn keen interest. Debabrata Mukherjee, vice- president, strategy and still beverages, Coca-Cola India, said a clear articulation of the demographic segmentation in Census 2011 allows the company, being a marketer of consumer products, to focus its strategic priorities in line with those opportunities. “This is especially useful when we plan our OBPPC (Occasion, Brand Price, Pack Channel) strategy for our portfolio, roll out new products, or even innovate for a totally new segment of consumers. The census data also helps us sharpen our consumer communication and choose the right media vehicles to reach out to consumers," he said. “This data is relevant from an economic, demographic and marketing point of view...it will help marketers and research build accuracy around further studies," said B. Narayanaswamy, consultant at Ipsos Research, a market research company. Previously, marketers and researchers were using similar data based on the 2001 census, but with approximations, he said. Trackers of the consumer economy have been enthused by the earlier rounds of Census data that showed that the country is exhibiting distinct signs of trading up as material living conditions improve for large sections of the population. The detailed demographic numbers will now enable consumer companies to better target their sales pitches. According to the Housing Census data for 2011, people in rural India saw significant improvement in the quality of houses they live in, as they did in terms of access to water. They also saw similar improvement in access to banking facilities with over one in two households having access to a bank as compared with a little less than one in three in the 2001 Census. Some consumer durables have seen a dramatic increase in terms of penetration (or the proportion of households they reach)—nearly one in two rural households now owns a mobile phone compared with two out of three in urban households. The data also shows that one in three rural households now owns a television set compared with almost one in five a decade ago. In comparison, 76.7% urban households now have television sets against 64.3% in 2001. India’s old age population, or those above 60 years old, now constitutes 8.57% of the total population or 104 million, signifying that the population may be greying faster than the policymakers realize. According to Helpage India, a non-governmental organization, India’s population of people aged between 60 years and 80 years will increase by 326% between 2000 and 2050 and those over 80 years by 700%. The overall population, it estimates, will increase by 55% in that period. Vidhi Choudhary contributed to this story.